Year 2012, what a year! And my how time flies so quick, I can't believe it's almost 2013 already. As I sat down to write this post I looked back at some of the photos we took and blog posts we wrote over the last twelve months, and looking back at it all I suddenly felt a sense of nostalgia. What a wonderful year and what a blast! Yes there were the Queen's Jubilee, The London Olympics, and of course the record breaking summer rain that was happening at the background. However in our own realm and in our blog so many things have happened and so many experiences and memories have been attained. A truly unforgettable year for us in more ways than one. The blog is our open online diary that we refer to from time to time, to look back at the activities we have undertaken previously and to check on the progress of the garden as a whole, individual plants, as well as other things like the pond project. It also gives us a quick view on how the garden changes with each passing month and what we can look forward to around the same time next year. And being an online diary I had good fun looking back at all of our posts this year and selecting only a few to be the highlights that best represent each month. Selecting was fun yes, but not easy! It took me ages to narrow down the selection but I eventually managed to do so. There are no right or wrong choices I suppose and my main purpose is just to give a general overview of the blog through this year in just one post. A new year it was and a new beginning! This was the month we posted the first of a series of posts about our Pond Project and this first instalment turned about to be one of our most popular blog posts of all time. 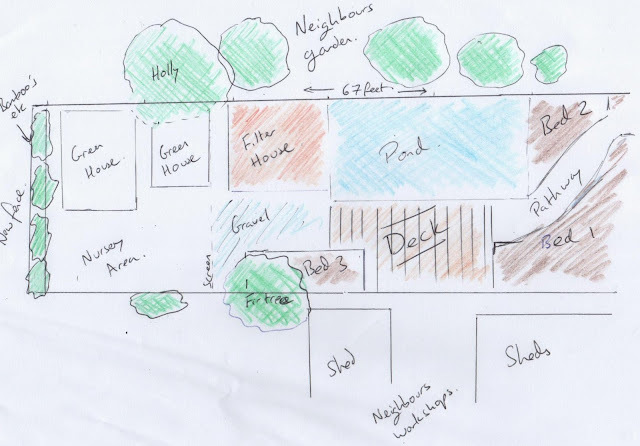 It was also in this month that I formally introduced the plans and shared our sketches for The New Garden which we are still in the process of finishing along with the pond itself. All should be completed by spring next year, cross fingers! With daylight noticeably much longer and the promise of spring just around the corner I posted about our herbaceous and hardy Persicaria Collection. 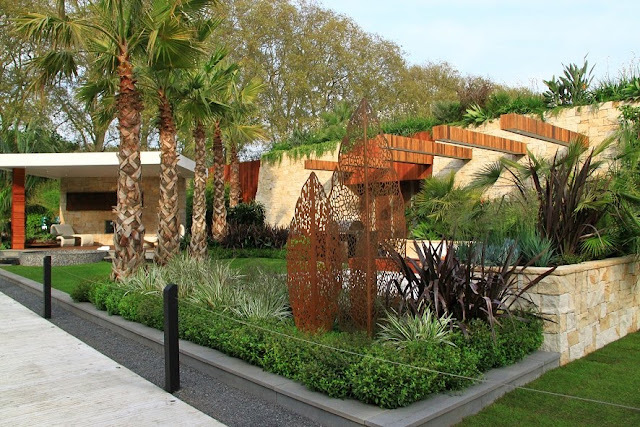 This is also the month where the garden show season starts with the RHS Plant and Design Show held in the horticultural halls in Central London. We always look forward to this show and it has become a tradition for us. It is also the only time where Gaz willingly drives into Central London so we have the car with us to conveniently bring back home all of our plant purchases. Being the opening and first big plant show of the year, it is a nice break from the long winter and gives that initial inspiration for the coming growing season. Winter is almost over and spring is definitely just around the corner. And if lucky you might get a nice warm spell as early as this month to put you in the mood to start gardening in full force. But weather conditions can still be volatile and one moment it's warm, the next moment it is frosty or even snowy. So best to remain on guard this month and to continue keeping an eye on the weather! But last March turned out to be a nice and relatively warm month, warm enough that we were able to finally plant out one of our Large Yuccas after being in a pot all winter. This yucca is one of our biggest specimen plants in the garden and occupies pride of place in the raised bed it was planted into. And it was another step closer to finishing the new garden that I wrote about last January. It was also this month that we spent a long and fun filled Weekend in Devon that we are hoping to replicate again next year! Spring has definitely arrived and the weather has been very good most for most of that month. The Garden in April was a glimpse of what garden looked like early in the growing season. And with it also being spring, we were in the mood and needed some new plants and one of our favourite nurseries to visit in the spring is Beeches, which we did that month and featured on our blog. Ah May, wonderful May! The month where the garden season goes into full swing and with so many activities happening on this month, it could easily become the busiest time of the year for any gardener. In this month we gave further updates on our continuing Pond Project. We also attended the Chelsea Flower Show and had the chance to meet and chat with Australian garden designer Jason Hodges who designed the Trailfinders Australian Garden presented by Fleming's and they were awarded a Silver Gilt medal for their excellent garden. It was also this month that we spent a week in Cornwall and one of the highlights of our week long stay was a visit to the spectacular Minack Theatre. And from Cornwall we fast forward to our day out in London as we spent some time shopping for new garden accessories in Camden Market. Then June came and it was still raining! So much for a hose pipe ban, you wouldn't need it to water the garden. The heaven's above had been doing it generously for days on end and there were no signs of it stopping soon. Still gardening life goes, and so did lots of plant fairs including the Cottesbrooke Gardeners' Fair which is one the best plant fairs one could ever attend. It was a very wet and muddy affair indeed, a sharp contrast to how lovely and warm it was when we went the year before. But we were kitted out and prepared to protect ourselves from the elements and had a lovely time. No rain could stop us from getting lovely plants! And it was this month that I had the chance to feature St. Michael's Mount which we visited the month before. 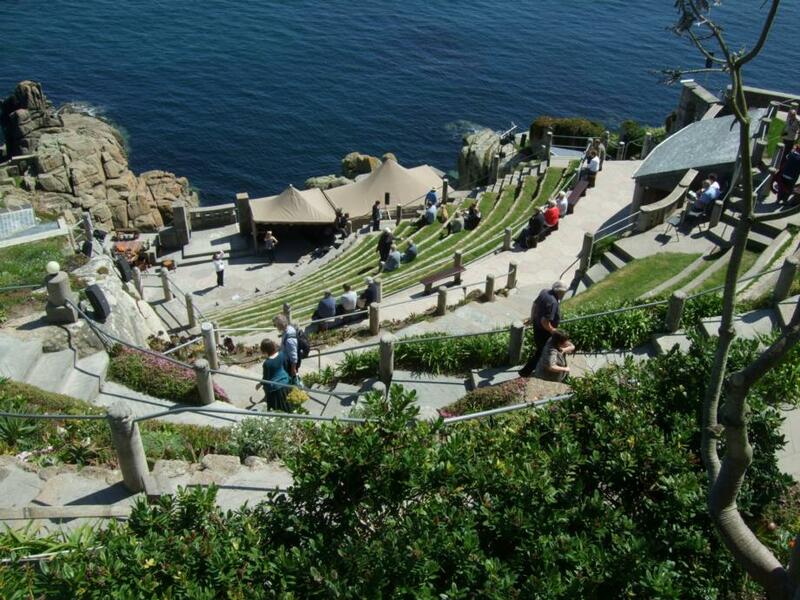 A truly spectacular place to visit, with it's historic castle, stunning views, and a gorgeous exotic garden to match! And this month came and yes, it was still raining! So much so that the hosepipe ban was finally lifted. Now this time we should have finished the pond project but alas, the relentless rains have taken its toll. There's only so much you can do when it's been raining almost non stop. For one thing, how could one paint long pieces of wood, multiple times too if its wet all the time? And nope, we don't have the space to erect a temporary marquee either. So bit by bit, one by one, very slowly I managed to paint them all Bright and White in the only dry space possible, a narrow passage way! Nice Weather for Ducks it was, but we carried on being optimistic. Negativity never leads you into anything productive. But despite the frustration from the weather, all annoyances have disappeared when we attended the wonderful Hampton Court Flower Show and had the chance to chat with garden designer Paul Hervey-Brookes who designed the Discover Jordan Garden, which was rightfully awarded a Gold medal and best in its category. This flower show is colossal, you probably need two days if you want to absorb everything, and the garden designs featured here are a bit more applicable to a typical back garden, much more so than the other flower shows. Rains had started to ease off and we were able to give the third update of the Pond Project. But with the height of summer already and still no signs of proper sunny and warm 'summery' stretch of days, it was probably for the best that we sought this 'summer' somewhere else. Good timing that it was also the wedding of our good friends Laura and Lucien in the Greek island of Rhodes where we spent a fabulous week soaking in the warmth of the sun and lovely atmosphere. We gave the experience Douze Points pour la Grece! Well what can I say? It was a non summer of a year and now it was time once again to start thinking about getting the garden ready for the coming colder months. Activity in the garden has eased off a bit too, being quite late in the growing season already so I finally had the chance to write and feature one the best plant nurseries in the west of England, The Duchy of Cornwall Nursery. We also had the chance to finally go through the hundreds of photos we took whilst in the spectacular Tresco Abbey Garden last May. Our trip there was a bittersweet one, for the helicopter service was about to end so we took the chance to go there for the last time via a helicopter. I'm sure we'll be back again, but it has to be through a much longer ferry journey, and will entail actually staying in the island for a night or two. It may be late in the season but most exotic gardens are looking their most lush and lovely at this time of the year and we showed how our garden was looking like in late September. We were pleased with how the garden has looked despite the minimal attention we gave it as we carried on concentrating on finishing the pond. Autumn was just around the corner and with the previous months being so busy, we never had the chance to visit RHS Wisley. So before everything goes into winter mode we paid the lovely garden a visit and featured parts of it on several posts, including their very interesting Alpine Troughs which is a source of ideas for ones own garden. We have also given another update on how our garden was looking like in October. And as for the new garden, well we managed to finally lay the Stepping Stones leading on to the future decked area. Another task ticked off from the list! You could definitely feel the chill in the air and the presence of autumn was now unmistakeable. Time to tuck away some of our more tender exotics and one of the places we store plants over the winter in the "Exotic Shed". The jungle hut at the end of the garden use used to store plants in winter. And with the clocks having gone back an hour it meant that it was dark already by the time we get back home from work, which also means less time spent outside and more time reminiscing of wonderful places we previously visited. And one of these places is funnily enough a train station in the city of Madrid, the Atocha Railway Station. We wish more railway stations would look like that! The time of the year when gardening, even for gardeners takes a back step to make way for Christmas pre-occupation. Somehow, no matter how much you prepare yourself it still becomes a manic period for everyone. But it was also the perfect time to look back and reflect on previous events and one of which, and up there as one of the main highlights of our gardening year was a visit from Loree of Danger Garden. She visited us in late September and have featured her visit in her own blog and from there we have posted our own thoughts about the wonderful experience in Hosting Danger Garden. We are hoping to return the visit sometime very soon! And after having been to Paris several times before and not having had the chance to check out the city's main glasshouses, we finally did it this time on our long weekend break there this month. Jardin des Plantes and their glasshouses are well worth popping in to if ever you're in this delightful city of love! So there you go, a recap of our blog year 2012. Not bad for a personal blog! The only other thing that overturns our happiness looking back at this year is our excitement for what's in store for next year. A big, huge thank you to all our readers and wishing you all a wonderful New Year ahead! And stay with us, for there's more in store for next year. Keep us company and tag along on our continuing journey into the world of exotic plants, gardens, and gardening! Indeed Helen! It was a nice trip back memory lane for us too, amazing how much has happened in the past twelve months and some events felt like it happened a long time ago too, and not as recent as just a few months ago. Best wishes to you too! Yay for an excellent review! Reading yours (and a similar one from Gerhard) got me to thinking about all the wonderful things I got to do this year too (in addition to visiting your country and garden), thanks for the walk down memory lane (both yours and mine) and here's to an equally (more so?) fabulous 2013! You've come a long way this year. Your garden looked fantastic all year, your pond is almost done and along the way you got some fantastic visits in to some great places. Overall I'd say that makes for a fun and productive year. Wow, you've had an exciting year. I definitely like your new stepping stones. Thank you :) We're pleased with how it looks like! Thanks for the review. What a treat to revisit these posts, it was like seeing old friends again. It's been a treat to glimpse your adventures through your cool blog! A pleasure outlawgardener, and thank you too! Wishing you the best for 2013 :) It was a treat for us as well, to go through the things we have done in the past twelve months! Thank you so much, Mark and Gaz, for your fab review of the year. You guys always inspire me. I'm sitting here on a really miserable day, worrying about a yet unexplained damp patch in one of the bedroom cupboards, and you have reminded me that there are far more exciting things to see and do out there. Happy 2013! Wow! What a year of exotic adventures. How will you ever top 2012? Of course, half the fun is in the trying. The visits to other gardens is always a fun part of your blog(an that train station in Madrid is STUNNING). 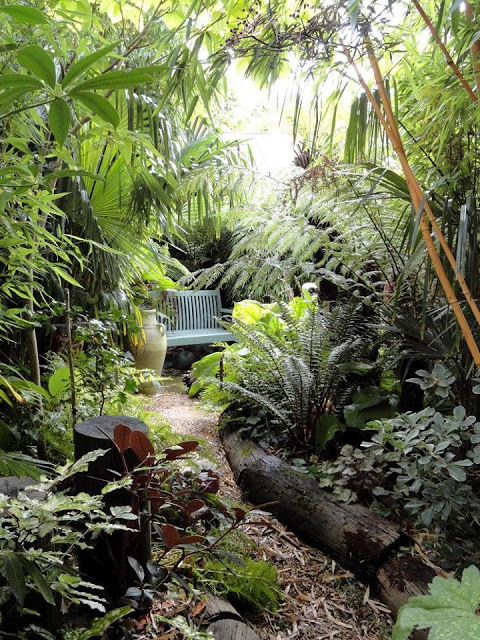 However, I still like viewing the scenes of your own tropical garden the most! Such beauty there. Glad to see Lorree got to visit. How fun! Happy Green Thumbs for 2013! Thank you David :) The blog has evolved to be a combination of about our own garden, other gardens, plants, and nice garden related places we go to. And lots of nursery visits. But the home base will always be about our garden. Have a lovely New Year ahead! So much achieved in your new garden in just a year - WOW! And many thanks not only for your blog but for all the help in getting me started - its almost a year since I set up mine! Good luck for 2013! It's absolutely incredible that you guys did so much work - from building shades, decks, path to pond - in your own garden. Wow! Any update about that Koi Pond? In what stage is it? Happy New Year :-). Can't wait to see the pond project finished and see how you blend it in with the rest of the garden. Happy New Year - it looks like exciting times are ahead. Happy new year guys,I really enjoy your blog. I saw you both at Chelsea, Tresco and at Kew. If I see you this year I will say hello! That'll be cool Richard if you spot us in person for the fourth time :) And yes please say hi this time! I enjoyed the look back, but it does make me anxious to see your garden completed next year! I can't even imagine how anxious you must be! I hope all goes as planned. I am still stunned by how beautiful your stepping stones are, and I know the pond is going to be over the top fabulous when it's complete. Happy New Year! Fabulous end-of-year post, and what a staggering amount you've accomplished in 2012. Hoping you get a drier summer in 2013. Happy new year! You did have a wonderful year. May your 2013 be even better--of course it will be, because the pond will be filled and running. Happy New Year! I have enjoyed following your blog and look forward to reading about your garden adventures in 2013! Can't wait to see the finished pond! Since I found your blog only recently, this recap felt like it brought me up to speed. Happy New Year! I'm looking forward to seeing what marvels you will pull out of your hats in 2013. Hi ricki, I'm glad you found the recap handy :) Tag along with us for 2013, and looking forward to you keeping us company via our blog! Happy New Year! I've really enjoyed reading your reminiscences about 2012 - what a full and interesting year! I wonder what the weather will be like this year - hopefully plenty of sunshine!! I look forward to seeing the development of the new area and pond and your travels and garden visits too - really inspiring. What an eventful year the two of you had, both at home and elsewhere! I love the month-by-month format of this post; it make me feel like I was right there with you. Surely 2012 must be The Year of the Pond Project? I've loved reading about your plants and travels too, but it is the pond that has caught my attention the most, can't wait to see it full... Happy 2013! It was Janet :) and Happy 2013 to you too! If the weather cooperates (although apparently it will get cold next week) we should finish nearly everything by early spring.